So, let's all take a moment and pretend that it's actually January and the new year is still quite fresh and that I'm not getting around to posting this list four months into 2019. I've been wanting to post this list for ages, but now that I'm able to make more time to post here (AKA: not be able to fall asleep after my husband's alarm goes off at 5:15am), this is one I want to put out there, despite it being unfashionably late. Books are the one thing I hold onto desperately during this busy time of life...I may not have time to finish creative projects, to write regularly, to manage much "self care" at all—but no matter what happens, I have to be reading something. I need a good book in my hands at some point during every single day. Getting lost in stories or feeling inspired by someone else's life or reading a charming chapter book aloud to my girls...these things center me and, to be quite honest, make me a happier person. Wonder by P.J. Palacio — I agree with pretty much everyone else who recommends this book across the board to kids, teens and adults alike. The story follows a boy who was born with a severe facial deformity, and I was so touched by all the different viewpoints shown throughout each chapter. I think it helps create empathy and understanding for everyone—and not only the boy, but everyone who is in his life, from parents to a sibling to a best friend to a "mean" kid. I read this when Verity was still a newborn and I was nursing around the clock. I pretty much bawled my eyes out over and over again as I read the chapters while feeding her. (I'm not sure what made me think I could handle a book like this while postpartum hormones were raging through my body, but what can I say?) I can't wait until my girls are old enough for this one. I want to wait until they're a bit older, so they can truly grasp the story and take it all to heart. And I'll possibly just have them listen to it on audiobook, because I'd like them to hear the story and not just witness their mom weeping openly. There's No Such Thing as Bad Weather by Linda Akeson McGurk — This is possibly one of the best parenting books I've read. I typically don't enjoy books that compare American parenting culture to other cultures, because at the end of the day I'm still here in the United States, so I can't very well raise my child to be a well-behaved french child who eats everything they're offered and sleeps through the night within two months. (Yes, certain books make me bitter.) This author has a great balance between her application of Scandinavian parenting philosophies and the reality of raising children in a non-Scandinavian country. Although it isn't a book specifically for homeschoolers, it reinforced my passion for the unconventional way we choose to educate our girls. This book offers so much encouragement about things you can do to be intentional about getting your child into nature, letting them learn and grow by making mistakes and being independent, and making adventure and play a priority—regardless of the weather. The only chapter I couldn't fully embrace was the one on "Free Range Parenting", because I'm all for my girls roaming around the forests of rural Scandinavia...but our neighborhood in LA County where I'm grateful for the gate around our community? Not so much. This book is an awesome read for any parent who strives to give their children more. More nature, more exploration, more freedom, and (sometimes) more muddy clothes. Mere Motherhood by Cindy Rollins — This is a book that has been talked about often within the homeschooling community, and I finally received a copy of it for my birthday last year. I have no idea why I waited so long to get my hands on it...I absolutely devoured it and the pages were like a balm to my soul. (Call me dramatic, but that's really the only way I could describe it.) This book is not what you'd expect from a Christian, homeschooling mother of 9 (and now grandma to many more). Her wit and charm and honesty had me hooked within the first few pages. This is one I'd like to reread this year—and many times after that. The Doll People by Ann M. Martin — We do a lot of read alouds here at home and this series was hands-down my favorite from last year. Both my 7 year old and 3 year old absolutely adored it and by the last book in the series we were pretty sad to say goodbye to our adventures with the Dolls and Funcrafts. Many of the pages are filled with gorgeous illustrations, which I think makes it even more appealing to the younger set—and it is so charmingly written and filled with such wonderful characters, as well. We would find ourselves laughing out loud many times during each of the books and couldn't wait to pick them up again and again. Even though it's been months since we finished the last book, we still randomly quote parts of them to each other (which makes me so happy). Out of the four books, I think that the first remains my favorite, but each one is absolutely delightful. I recommend them all! Fierce Kingdom by Gin Phillips — When a book makes me stay up until nearly midnight to finish it, it is one I absolutely have to recommend. I don't sacrifice sleep often, but when I do it will most likely be for a good book (or white cheddar popcorn and cheap wine). This story is definitely a thriller! The story follows a woman and her four year old son who are at the zoo when something terrifying happens (no spoilers here) and they have to survive the night in the zoo without being found. It is incredibly well written and I couldn't put it down. The way the author captured the relationship between mother and son was just the sweetest thing in the world. And it made me wonder what I would do if I were in the same situation as this mom. Before I Go to Sleep by S.J. Watson — This was one of the most satisfying thrillers I read last year (and I read many, considering it's possibly my favorite genre these days!). It was so creatively written and the premise was fascinating to me. The story focuses on a woman with a specific type of memory loss that makes her lose all memories of each day when she goes to sleep at night. She wakes up every morning with no idea who/where she is. There were a couple twists that literally made my jaw drop, which I personally enjoy. Caroline by Sarah Miller — This book is a fictionalized account of Caroline Ingalls, or as most of you know her: Ma from the Little House books. If you're an a fan of that series (and I am, as I consider them my favorite books of all time) then you have to read this book. You have no choice. You must read it, and then please let me know that you loved it as much as I did. It was so good that after raving about it online, my mother-in-law generously sent me my own copy so I'll be able to reread it over and over. (I don't reread books often, but this one I wanted to pick up again almost immediately after I finished it!) I was afraid the author wouldn't do Caroline justice, but she absolutely did. The writing feels very much like the original writing of Laura Ingalls Wilder, and it was so delightful to relive the familiar stories through the eyes of Ma...the big move, nearly losing Jack, meeting Mr. Edwards, the prairie fire, the building of the cabin, and others. I cried during the chapter when Carrie was born because it was so perfectly written. I would call this book perfect, but towards the end there are two chapters with sexual content that did not fit the tone of the book at all. In my opinion, it took away from the overall reverence the book had otherwise for Caroline Ingalls (she would have been mortified to have such things written about her in a book). That said, this book is one you absolutely have to read if you consider the Ingalls family cherished literary friends. The Woman in the Window by A.J. Finn — I must say, all the buzz about this book is totally accurate. The main character is a woman with agoraphobia, and her back story slowly unfolds throughout the book. I don't want to give much away, so if you haven't managed to pick this one up yet and are looking for a book to keep you up late into the night in order to finish, get this immediately! It's the perfect page-turner and won't disappoint. Okay, it's your turn! What is one book you read recently that you can't stop recommending? These days, I'm knee-deep in raising my three girls. Which means that life is a never-ending stream of art projects, library books, make-believe, dirty dishes, breaking up arguments, Costco hauls, homeschooling podcasts, and counting down the minutes most afternoons until I hear the garage door open and I know Jay is home from a long day at work. There are hard days, but there are oh, so many more good ones. Someday I'll write more about Verity's first year, and how it was hands-down the most difficult year I've ever experienced as a mom. I'm only writing here today because I've started to feel like myself for the first time in many months, and all of a sudden it seems possible to reclaim some things that used to make me so happy. Someday I'll jot down some thoughts on our current homeschooling year, and how it has been absolutely the best one yet. I didn't even encounter the February burn-out that is rather common among us homeschool mamas. Can I get a hallelujah? Someday I'll share some big thoughts about marriage, about how I'm still getting to know the person I married thirteen years ago, about the wild ups and downs of living life with the man I chose—the man I was given. Someday I'll take the time to record all that I've gone through for the last few years, and how entering my mid-thirties is quite possibly my favorite. I'm so much more kind to myself. I see the privilege of gray hairs, wrinkles, a soft stomach, messy emotions, messy floors, messy relationships. So, yes, I'm still here. And I'd like to reclaim this space now that I feel like I have my head (mostly) on my shoulders once again. 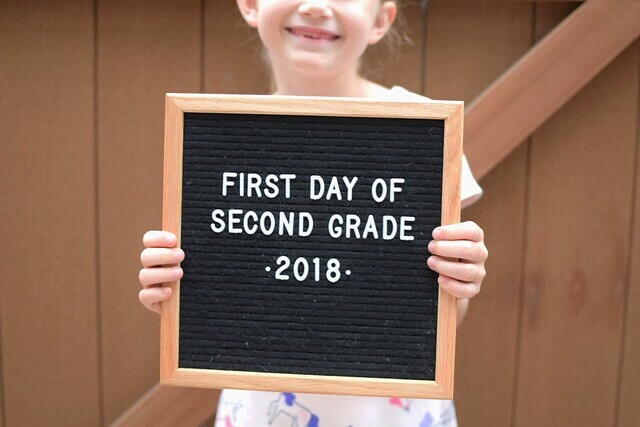 If you're curious about what we did for Eisley's first grade year, here were the plans, and here is the post where I shared some reflections at the end of the school year. As for this fall, I had decided on most of what I wanted to do before summer even began (yes, I'm that mom who nerds out on planning curriculum way before the school year is even on the horizon). I was especially eager because I knew we'd be able to purchase many things we wouldn't normally be able to justify spending so much money on, as we had joined a charter school program for homeschoolers over the summer. The program is through a charter school called Valiant Prep and is open to homeschoolers in CA each summer. We were given $500 in funds to use on educational supplies, curriculum, field trips and classes. I kept it simple and spent just over $400 on curriculum, art supplies and other school supplies (glue sticks, pencils, etc.). This was a lot of money to spend, especially given I spent hardly anything on actual curriculum for Eisley's schooling up until this point. (I have relied heavily on the books we read, the library, and the huge number of free resources online.) Although the funds given were technically for continuing school throughout the summer, I knew anything I purchased would be used through the regular school year, as well, so I was sure to keep that in mind when I was selecting items to buy. I also wanted to stick to "consumable" items, because anything we couldn't write in or use up (for instance, a Kindle or regular books) would have to be returned when the summer program was over. Throughout the summer, we had to do two check-ins via Skype with a teacher affiliated with the charter and give one sample of work for each meeting. (I ended up using Eisley's country study each month as one sample, and also had her write a few sentences about something she learned for a handwriting sample.) It was weirdly simple, and I kept wondering how it was possible to receive so much money in educational funds without needing to prove how we were using every little thing. At the risk of sounding trite, the whole thing was a huge blessing to us. I've been hesitant to even consider using a charter for homeschooling (we are currently continuing to homeschool privately, which is an option that isn't available in all states within the US) but as the girls get older and we reach the point where we'd like to do more extracurricular activities or afford things like museum passes and such, then I feel it's something we would absolutely do. Our experience with this charter was just fantastic. We will take it year to year, but joining a charter is now an option I'm totally open to. I'm absolutely giddy over two programs we were able to afford this year, thanks to funds from the charter school I mentioned earlier. I've wanted to purchase Brave Writer products before, but they're a little out of our price range. I purchased their Quiver of Arrows language arts program, which teaches lessons in all areas of language arts that go along with chapter book read-alouds that are assigned each month. It may be a little easy for Eisley (she's ahead in reading/writing skills) but I didn't want to get the more advanced program until next year. I also purchased Jot it Down, which is a creative writing course for the early elementary years. Both products are digital downloads, so I am having them printed through this website (the turnaround time is not the best, but I like supporting this company and you can't beat the pricing). I have decided to not be overly ambitious with math during these early years. Call me crazy, but making my child a mathematical genius (to the detriment of our own sanity) isn't really my jam. As long as we are doing math daily and Eisley is consistency hitting the standards for her grade level, then I'm a happy mama. I do a lot of math practice with her throughout the day that happens pretty organically (having her help me bake, working out math problems that relate to something we are doing/reading, counting money, telling time, etc.) but for our daily scheduled math work I did purchase this workbook from Amazon. There are some wildly expensive math programs out there, and this year I didn't want that to be my focus. Next year, I'd like to invest in a math curriculum that includes manipulatives and other such goodness that I will use with the other girls later on, as well. But this year, we are simply committing to quick, daily lessons that will keep us on track and not overwhelmed. Our big purchase (from our own pockets) this year was the My Father's World Adventures in U.S. History curriculum. This covers all the subjects listed above, and has a nice weekly schedule included. The schedule is set up for a 4-day school week with Fridays set aside for nature walks/study. This is the most we've ever spent on curriculum, but I can already tell it's absolutely worth it. We did get a nice discount, choosing the "basic" package, which didn't include the read-alouds (which we can get from the library), the art curriculum (which we purchased separately with charter funds), or the music appreciation curriculum (which we can do on our own). My mom recommended this curriculum to me because it was one of her favorite years of school with a younger sister of mine, and I'm so glad she pointed me in this direction! We were able to get the I Can Do All Things art program with charter funds, and it has been a delight so far. Also, a family friend offered us a violin that we can use with Eisley for music lessons, so I'm toying with the idea of signing her up early next year—after the holidays, and after the rest of our homeschooling schedule is well established and I'm sure I can easily fit in something else. Every morning, we spend 30-60 minutes (sometimes longer) doing Morning Time, which includes things like prayer, bible, poetry, memorization, read-alouds, daily Q&A, and other items. (I'll post more details about our routine later on!) For cursive, we are doing Handwriting Without Tears (and it's amazing how much she's learned even over the summer). As far as extracurriculars, we will continue with American Heritage Girls, which we adore. We lucked out in finding a large, well-established homeschool troop last year, and I can't speak highly enough of this scouting organization! I'm also signing Eisley up for a PE program for homeschoolers that introduces the kids to a variety of sports throughout the year, and I believe we will begin that in October. We are taking a break from any sort of weekly homeschool co-op for a variety of reasons, but it's the best choice for us right now. I feel much calmer about many things this year, as opposed to years before. Having one "official" year of homeschooling under my belt is a huge relief—and I learned so much about keeping things simple and consistent. There are so many years ahead to fit in all we want to do...co-ops, dance classes, music lessons, art class, and other adventures. In this day and age, it's hard to remember that a seven year old is just a seven year old. My daughter doesn't have to do it all right now. Interesting how I feel the same way about myself, and I'm thirty four. Ah, yes. It's a good reminder of us all, regardless of age and stage. In any case, there you have it! My typically long-winded post on all things homeschooling. I'll be sharing more details about our routine and such later on, and aside from these posts I hope to find time to write more overall. If you have any questions about homeschooling, definitely ask away! My knowledge is (clearly) limited, but I'm more than happy to share what I've learned so far.